Many years ago we discovered a happy, mysteriously isolated place. The hills, nearly mountains, there are rich with dense forest and wild boar, thickly built stone homes as well as beautiful vineyards and fields of grain. 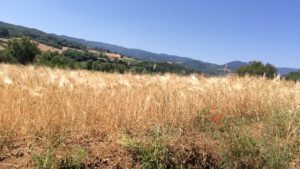 This is the Casentino, a region in Tuscany that’s conveniently just two hours directly east of Lucca and just north of Arezzo, yet it is mysteriously free of tourists. 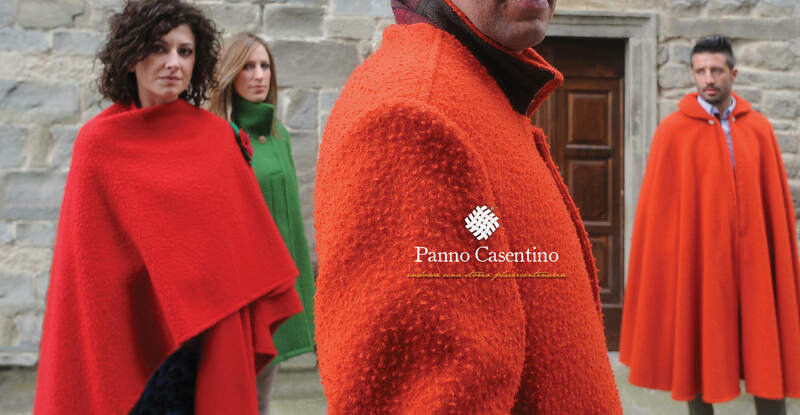 It is the home of the famous eponymous woolen fabric casentino which hunters, children, and noblemen alike wear proudly and comfortably during the winter, as they have for centuries. It is where Civettaja — one of Italy’s new award-winning organic pinot noirs — originates, and near the vineyards of Castello Pomino and other Frescobaldi wines. 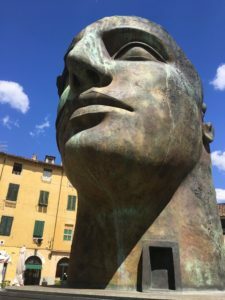 This is also where the mountain, Montefalterona, gives birth the Arno river that flows through the heart of Firenze, and which inspired political exile Dante Alighieri to reminisce about its fame in his home town. 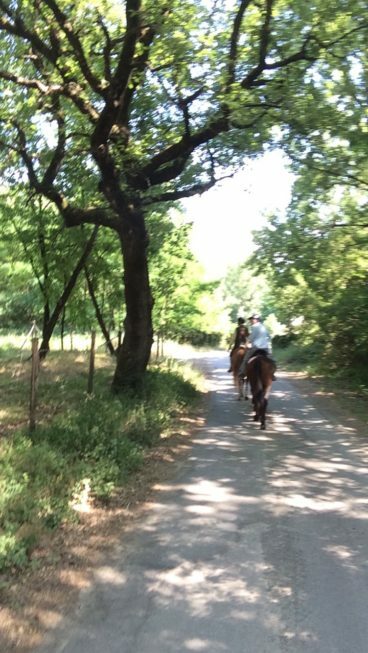 Years ago, my father, children and I escaped all responsibilities by booking a room at an agriturismo in the Casentino where the owners raised wild horses and led excursions into the forests to hunt mushrooms and wild boar. Even though my kids were too young to indulge in more than a ride around the corral, my sons happily soaked in the atmosphere imagining themselves something between cowboys and knights. The innate warmth of our hosts made the excursion idyllic, and our communal evening meals of wild mushrooms and fresh game that other guests had snagged, were extraordinary. The experience embodied “locally sourced” and “slow food” before either term was invented. Alas, there was no locating the Agriturismo Croce ai Mori this year. But we did discover a new place well worth the trip: the horse farm at Equinatura in San Donato (near the towns of Pratovecchio and Stia). Its owner and chief trainer, Giovanna di Buonamico, has lived in the area for over 30 years and is an expert with a sixth sense for assessing riders. 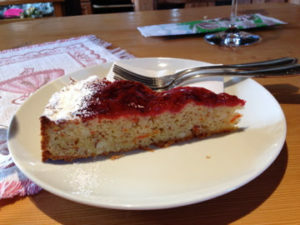 After an orientation in their corral, her husband guided my son and me on a two hour tour on horseback through the countryside, passing blackberry brambles, wild cherries, golden fields of grain (yes, they do exist!) 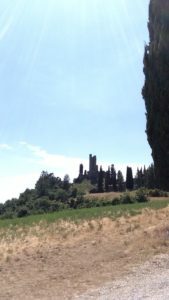 and finally, circling the imposing 10th century fortress of Castello di Romena. During the tour, we crossed the Arno on horseback twice, saw a couple of wild boar parents usher their six babies across our path, and stopped by a spring which inspired lines in Dante’s Divine Comedy. We felt so out of touch with modern life, so immersed in the early renaissance feel of the place, that we forgot about the time and finished an hour late. 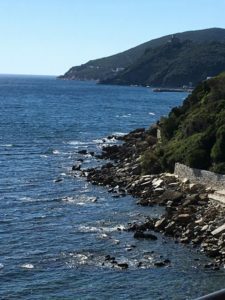 We did not stay in a farmer’s stone ranch as on our first foray into the Casentino, but at an unassuming and charming hotel, Albergo Falterona, in a 15th century palace in Stia. While our room was London-hotel room-tiny, it was beautifully designed to make maximum use of every inch. The decorating felt historically correct, yet it was unpretentious, even casual — a truly Tuscan feat that was refreshing and welcoming. The bedroom easily accommodated three of us plus luggage and was complemented by a very modern bath — fresh and clean. Across the street, the hotel’s restaurant offered sophisticated nouvelle Italian cuisine and great wines, while not forgetting to offer excellent bistecca alla fiorentina. 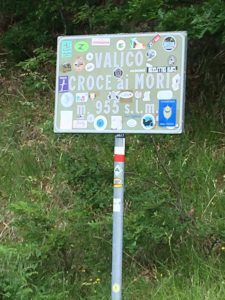 After our horseback excursion, we explored the Apennines around Stia, working our way to the mountaintop called Croce ai Mori (Moors’ Cross). The exceptional view from the 955 meter peak compensated for the switchback, sometimes one lane drive through the forest to the top. On the way back down, we lunched at Locanda Fonte allo Spino. Our appetizer of fried dough with stracchino and prosciutto was an unusually scrumptious dish. 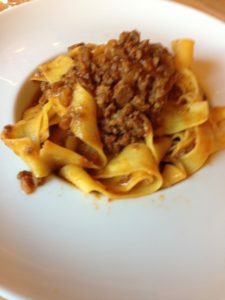 Better yet was the chef’s take on pappardelle con cinghiale (wide noodles with boar sauce). It was the best I‘ve tasted in years. The secret: juniper berries and cinnamon incorporated into the sauce. The pappardelle con cinguiale at Locanda Fonte allo Spino benefit from the addition of juniper berries and cinnamon — yum! All this hospitality and gastronomic quality makes one wonder why the Casentino isn’t a more popular destination. In the meantime, the lack of tourists gives those in the know all the more space and quiet to take in all the region has to offer.